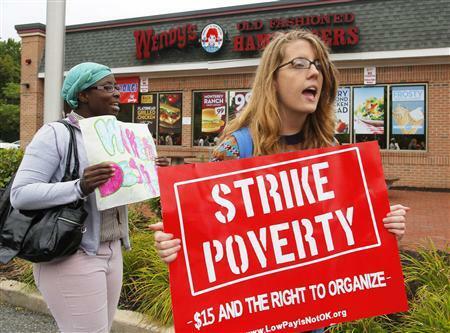 Strikers march outside a Wendy's restaurant in Boston, Massachusetts August 29, 2013, as a part of a nationwide fast food workers' strike asking for $15 per hour wages and the right to form unions. 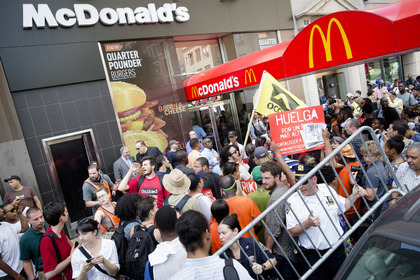 (Reuters) - Fast-food workers went on strike and protested outside McDonald's, Burger King and other restaurants in 60 U.S. cities on Thursday, in the largest protest of an almost year-long campaign to raise service sector wages. Rallies were held in cities from New York to Oakland and stretched into the South, historically difficult territory for organized labor.The striking workers say they want to unionize without retaliation in order to collectively bargain for a "living wage." "It's almost impossible to get by (alone)," said McDonald's worker Rita Jennings, 37, who was among about 100 protesters who marched in downtown Detroit Thursday. "You have to live with somebody to make it." In Atlanta, about 20 fast-food workers at two different chains presented their managers with "strike letters" before walking out, Roger Sikes, a coordinator with the nonprofit group Atlanta Jobs With Justice, told Reuters. "I'm doing it for the respect for myself and for my other coworkers," said Ryan Schuetz, 20, who works at McDonald's. He said his work hours have been reduced recently and that he was struggling to keep a roof over his head. Robert Hiltonsmith, a policy analyst at Demos, a liberal think tank, said that if the minimum wage had kept up with productivity and inflation, it would be closer to $17 per hour. 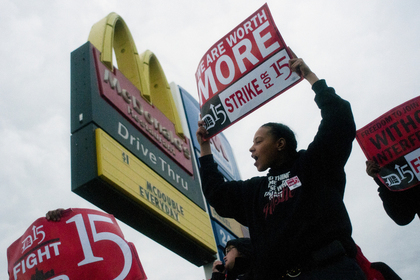 He added that in many cases, low pay wasn't justified by a worker's lack of marketable skills. "Seventy percent of these fast-food workers are aged 20 or over, so they're not teenagers, and of that 70 percent, about a third of them have college degrees," he said. "So it's not that they don't have skills - in many cases, the jobs aren't there for them." The National Retail Federation called the strikes "further proof that the labor movement (has) abdicated their role in an honest and rational discussion about the American workforce." And in the Wall Street Journal on Thursday, the conservative Employment Policies Institute ran a full-page ad with a picture of a robot making pancakes, warning that higher wages would mean "fewer entry-level jobs and more automated alternatives." Dorian Warren, an assistant professor of political science at Columbia University who has published work on labor organizing and inequality, said new protests in the South are "a huge, huge deal."